If I told you there was a power source out there that produces virtually zero carbon emissions, would you believe me? This form of energy production can also produce energy around the clock and is not at the mercy of the wind or the sun. Furthermore, it is nearly twice as efficient as natural gas or coal at generating power. Now what if I told you that nuclear power could do all of this? Many thoughts come to mind when nuclear power is mentioned, but it being one of the lowest greenhouse gas producers is usually not one of them. Perception is everything these days, and nuclear energy walks a line between two very polarized sides. The advantages that nuclear power offers are the reasons why the United States is one of the leaders in producing nuclear energy and why we have 99 nuclear reactors which produce around 20 percent of our electricity. How it works. In most power plants, you need to spin a turbine to generate electricity. Power plants use coal, natural gas, oil, and nuclear energy as fuel to turn water into steam and use that steam to turn a turbine. In a nuclear power plant, nothing is burned to create that steam. Instead, uranium atoms are split, in a process called fission, to create the necessary energy to boil the water. 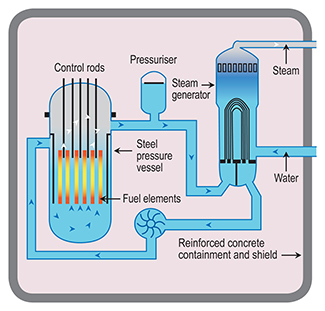 Nuclear reactors are designed to sustain an ongoing chain reaction of fission. In the United States, they are filled with a solid uranium fuel surrounded by water, which both harnesses the energy and helps facilitate the fission process. When a reactor is started, uranium atoms will begin to fission, releasing both neutrons and heat. This heat goes into the surrounding water and is then transferred to a secondary loop that creates steam, powering the turbine. 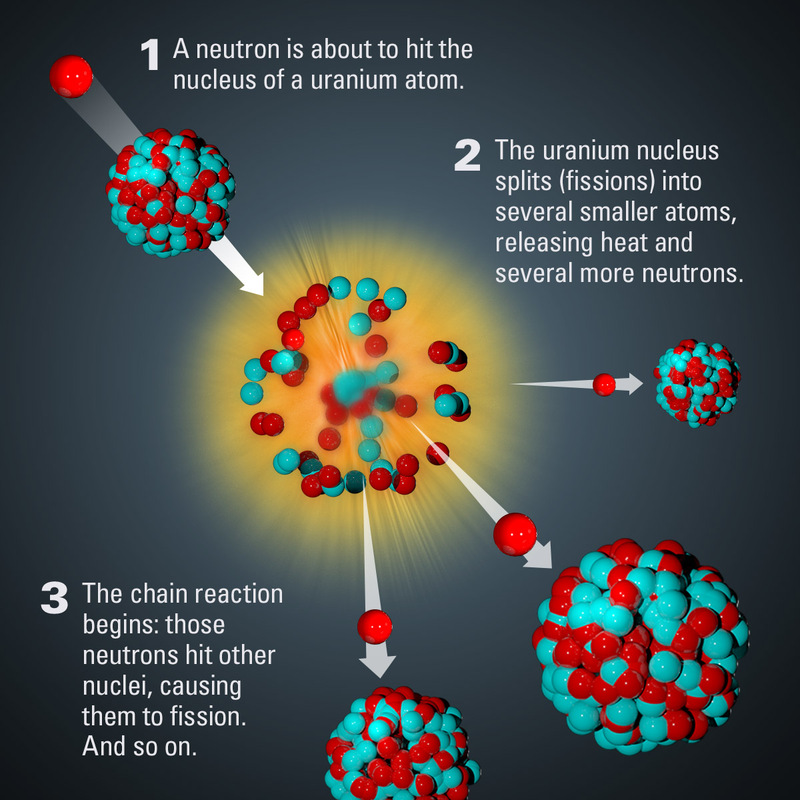 The neutrons that are created from the initial reaction collide and fission other uranium atoms, which produce more heat and neutrons, continuing the process. This process releases zero greenhouse gases into the environment, and only one-third of the fuel in a reactor has to be replaced every 1 or 2 years. Waste problem. However, with all of these advantages, there are bound to be some disadvantages. One of the biggest concerns with nuclear power is the waste it produces. Nuclear waste is made up of radioactive elements with relatively short or long lifetimes. A great deal of research has gone in to trying to separate these long-lived and short-lived radioactive elements. These separations can yield elements that can be recycled for use in other nuclear reactors and beyond, such as medical imaging or scientific research. Alas, the bulk of the waste needs to be stored in a safe location until it is no longer highly radioactive and can be safely reintroduced into the environment. The main issue here is how you store these radioactive materials. Most nuclear waste currently exists as a solid in temporary underground storage casks. The problem with this storage method is the same problem with any container: it can get damaged and then its contents could leach into the environment. One way of fixing this problem is not to focus on the containers themselves, but instead think about the actual form the waste is in. If the nuclear waste were in a form that is ultra-stable, you would not have to worry about its container cracking, because the waste would not leach. The safer the waste form, the less you have to worry about the actual container it sits in. How to fix it. One option is a glass waste form. A problem with these glass waste forms is the chromate and pertechnetate that can get incorporated into the glass. When the chromate is incorporated, it weakens the integrity of the glass. When the radioactive pertechnetate is incorporated, it can easily leach from the glass. Researchers at the Center for Actinide Science & Technology (CAST) are looking into ways of extracting these chromates and pertechnetates from the waste solutions before it is made into the glass waste form. A promising extractant is thorium borate [ThB5O6(OH)6][BO(OH)2], also known as SelectTech, which would use anion exchange to remove the chromates and pertechnetates from the solution and replace them with borates. SelectTech would then allow for a more stable glass waste form to be produced. In addition to CAST’s research, the sole mission of the Center for Performance and Design of Nuclear Waste Forms and Containers (WastePD) is to test and design new nuclear waste forms for long-term storage. The three main projects of WastePD revolve around glass, ceramic, and metal waste form development. To design better glass waste forms, they seek to understand how these forms react under storage conditions through simulation and experimentation. However, some things do not incorporate into glass as effectively, such as the highly radioactive cesium-135, and ceramics could help lock down what glass cannot. The metal portion of WastePD’s research hones in on corrosion-resistant alloys. These alloys have passive films that protect them from corrosion, but these films can break down locally if exposed to a rapid attack of corrosion. WastePD looks to utilize integrated computational materials engineering to optimize and develop novel corrosion-resistant alloys. The combination of these endeavors can help solidify nuclear energy as one of the pillars of energy production. Nuclear power is a great source of green energy. WastePD and CAST are looking toward the future of energy by tackling one of the greatest concerns with nuclear energy -- the waste. By learning to contain nuclear waste more safely, the future looks very bright, and that brightness is fueled by nuclear energy. David Dan is a Ph.D. candidate at Florida State University working under Thomas Albrecht-Schmitt and is a member of the Center for Actinide Science & Technology (CAST), an Energy Frontier Research Center. He focuses on designing and studying ligands for actinide separations.